One of the biggest benefits of living in Southern California is that you are less than a few hours away from some of the most beautiful mountain destinations. From Big Bear and Mountain High, to scenic Idyllwild and Mammoth, it’s easier than ever to find your next winter getaway, but driving there can be quite dangerous. At Marina Del Rey Toyota, we want to make sure that you arrive safely at your destinations this season. Here are a few tips to make the drive safely when in winter or snow weather. 1-2 large towels for wiping, drying off, etc. A good rule of thumb when it comes to driving in winter conditions is to remember that the posted signage and speed limits generally refer to “dry” conditions. If you are driving under snowy conditions, you should reduce your speed considerably. Avoid making quick lane changes or turns, and try to clearly telegraph your movements so those behind you can understand what you want to do. In areas where snow chains are required, you should follow the speed limit signs posted “with chains”. Remember your winter conditions and especially thick snow will greatly affect your breaking. And the size of your car can affect your breaking speed, so compensate for the size of your vehicle. If you will be embarking on your first winter trip this year, you may wish to consider taking a Winter Driving class to gain the practical experience of driving through snow and other winter conditions. Anyone who has driven in Los Angeles traffic understands the importance of remaining vigilant while driving, but in winter conditions, it is even more important. The good thing is that this is easy to do, and only requires you to do a little more than usual. Due to poor visibility, especially when it is snowing, you may find it hard to see cars ahead of you. Keep your lights on, even in the daytime, and follow the lights of the cars ahead of you. Try to maintain a safe distance at all times between you and the car ahead, about a car length of space. This will give you extra reaction time to turn or brake. Another great tip is to keep your eyes on the cars a few cars ahead. If cars ahead are beginning to stop/slow, it is going to affect you, and you will be able to react quicker to any effects that come down the line. Lastly, if you come across a snow plow or other flashing emergency vehicle, make sure to slow down, stay out of their blind spots, and give them about four cars length of distance. We know part of the journey to some of these sights, is simply getting there. There are few feelings that compare to entering a warm house or hitting the snow after a long journey. 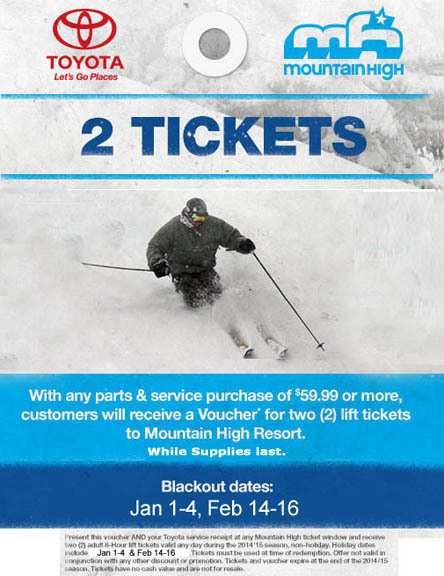 And since we are talking about vehicle maintenance and snow, we are offering two lift tickets to the Mountain High Resort with any parts and service purchase of $59.99 or more! It’s never been a better time to take your Toyota in for some winter maintenance. From our family to yours, we wish you a happy winter season and happy travels!